Giraffes live in open habitats, primarily wooded savannas and open woodlands. 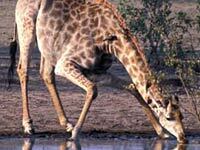 Riparian forests (those growing along watercourses) are especially important to giraffes living in arid areas. 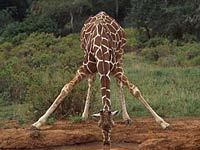 Giraffes do not live in areas dominated by moist tropical forest. 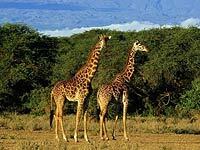 Giraffes inhabit many countries in sub-Saharan Africa, but are now most widespread in East Africa and the northern parts of southern Africa, where they find refuge in national parks. Giraffes have beautiful spotted coats. 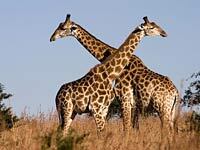 While no two individuals have exactly the same pattern, giraffes from the same area appear similar. The giraffe is the tallest living animal, uniquely adapted to reach vegetation inaccessible to other herbivores. Giraffes have a distinctive walking gait, moving both right legs forward, then both left. At a gallop, however, the giraffe simultaneously swings the hind legs ahead of and outside the front legs, reaching speeds of 35 miles an hour. It has unusually elastic blood vessels with a series of valves that help offset the sudden buildup of blood (and to prevent fainting) when the head is raised, lowered or swung quickly. Giraffe "horns" are actually knobs covered with skin and hair above the eyes that protect the head from injury. What does a Giraffe eat? They pluck the buds, fruit, and leaves of these trees with prehensile upper lips and long tongues that can be extended up to eighteen inches (45 cm). When protected, giraffes can flourish in areas where food is abundant year round. Although they drink water when it's available, they can survive where it is scarce. They occasionally eat grass and fruits of various trees and shrubs, but their principal food source is the acacia tree. The tree's sharp horns do not seem to stop the giraffe, which has a long, muscular tongue specially adapted to select, gather and pluck foliage. The giraffe is a selective feeder and although it feeds 16 to 20 hours a day, it may consume only about 65 pounds of foliage during that time. It can maintain itself on as little as 15 pounds of foliage per day. What are the natural enemies of the Giraffe? Giraffe tails are highly prized by many African cultures. The desire for good-luck bracelets, fly whisks and thread for sewing or stringing beads have led people to kill the giraffe for its tail alone. Giraffes are easily killed and poaching (now more often for their meat and hide) continues today. Giraffes are the tallest land mammals in the world, with heads that may tower 20 feet above ground. Their great height allows them to reach the leaves of the spiny trees that are their staple. They pluck the buds, fruit and leaves of these trees with prehensile upper lips and long tongues that can be extended up to 18 inches. They also eat grasses, seeds, grains and other low-lying vegetation. Did You Know these facts about the Giraffe? Even though giraffes are often seen together in groups, they do not form the complex social groups of many plains species. Theirs are loose associations, constantly changing in make-up. 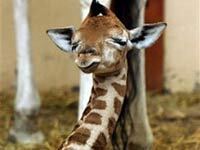 Baby giraffes are about 6 feet tall at birth. They can run around only a few hours after birth, but spend most of their first two weeks life lying down, guarded by their mother. Like fingerprints, no two giraffes' spots are exactly the same. The nine different giraffe subspecies have different spot patterns, from large to small and uniform to irregular. Download free Giraffe wallpapers, click on the image to open the large version. Print free Giraffe coloring pages, click on the image to open the large version.